Should the people revive Moreland Commission on Public Corruption? 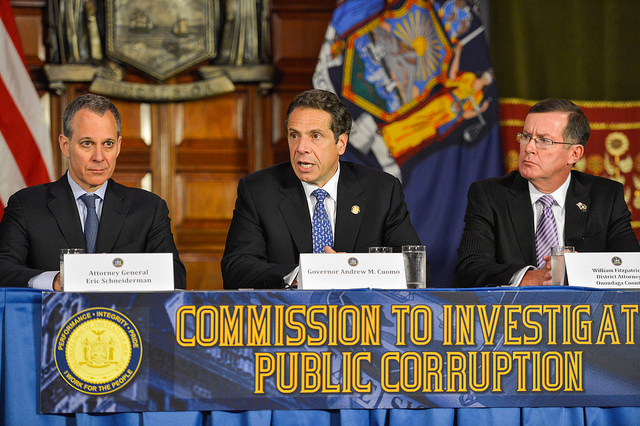 While criminal prosecutions continue against leaders of New York’s Legislature as a direct consequence of the Moreland Commission on Public Corruption, serious questions linger. For example, what came of all the shocking testimony and petitions lodged by the general public, limited as it was, on Constitution Day, 2013 at Pace University? What about the hundreds of speakers excluded from that hearing who were left outside protesting as a result? Why was the Commission prematurely disbanded, why were so many citizens misled into believing they could be heard and answered, and how much corruption remains rampant here in New York State due to the utterly impotent nature of that Commission? It certainly cost our taxpayers substantial money to create this “dream team” of prosecutors and experts to root out corruption in state government. And while we certainly commend U.S. Attorney Preet Bharara for his follow-up investigations and prosecutions, a review of the public testimony raises far more concerns than the ones supporting a prosecution of two legislative leaders. That testimony is found on our site at Leon Koziol.com. As one of the few who were allowed to participate from the general public, I raised serious issues concerning documented retaliation for my public criticisms on that site and my complaints of judicial misconduct in diverse filings. The retaliation has only escalated dramatically since that hearing. 1) Ellen Oxman, of Women for Justice in New York Courts, provided compelling testimony of her abuse at the hands of a wealthy opponent with connections to the judges in her divorce and family proceedings. Where did her petition go, where is she today, and what came of the brazen level of injustice she carefully documented before the Moreland Commission? 2) Carl Lanzisera of Americans for Legal Reform and a co-member gave startling revelations regarding a 20 year history of court corruption including the similar impotent conclusion of the 2009 Senate hearings on judicial reform. The chair of that Senate Committee, John Sampson, was later indicted for official misconduct while in office. Among the recommendations made by this organization was the mandatory psychological testing of judges who take our children from us to bring them on par with other government officials. 3) Michael Kraveski, a regular citizen, provided a heart wrenching seven year ordeal in Kings County Family Court which has become all too commonplace in America today, one which led to an unarmed father shot to death in the back while fleeing a support warrant at a traffic stop in South Carolina less than two years later. He described himself as a victim of a “money extortion scheme” through impossible obligations, fraudulent tactical petitions and a “Star Chamber” court. He suffered a stroke in the end after losing his job and life savings. 4) Rich Velotti, an attorney for Act Now New York made an ominous prediction of sorts when he described how Assembly Leader Sheldon Silver, Senate Leader Dean Skelos and former leader Joe Bruno conspired to influence and limit the work of the Joint Commission on Public Ethics, an entity comprised of members selected by them and the governor to investigate misconduct in Albany. All three were prosecuted criminally by federal authorities, none by the state. Attorney Velotti labeled the JCPE “a joke” with a strong recommendation that the Moreland Commission, with its independent investigatory powers, be made permanent. 5) Marie Tooker, a single mother of three, described a criminal enterprise in our courts which left her homeless with $12 in her bank account. 6) A Fordham law professor commended the Commission as an example of good government, never imagining that it would be dissolved in six months for doing the very work it was charged to perform. She emphasized the need for permanent “structural” changes to replace the “prophylactic” approach to public corruption which remains in place. 7) Elena Sassower was so emotional over the lack of judicial accountability over many years that she refused to yield to her allotted time as a speaker, even under threats of removal. 8) Katherine Wilson, a victim of divorce court, began her testimony with a request that certain Commission members cease their texting during the general public segment of the hearing. She also asked that one or more members who had left for the lobby during that segment return to their seats so that she could have the benefit of a full Commission. Needless to say, she elicited a resounding applause for her bold introductions after emphasizing her experience with “guns in her face” while living in Ireland. It left her without any fear of this Commission. When asked to conclude her remarks, she defended her few minutes of space with the one hour spent by the Commission chair lauding the credentials of members which were already found in the table brochures. She cited shocking examples of domestic violence victims who preferred to return to their abusive home environments than face the “battering” they sustained in New York’s matrimonial courts. You simply have to listen to her full presentation as I cannot do it justice here. 9) Marguerita Walter gave yet another heart wrenching ordeal at the hands of a corrupt divorce system with a “de facto termination of (her) parental rights,” some $150,000 spent on “supervised visits” and the ultimate permanent alienation of her children. She described 12 years of cruel and retaliatory acts for her exercise of fundamental rights after giving birth to children abandoned at an early age by their father. She was a Cuban refugee as a child herself fleeing from a corrupt communist regime headed by dictator Fidel Castro only to find far worse oppression here. 10) Not to be out done, Mr. Gallison, a reporter for secondary news sources, Truth-out and Black Star News, provided the Commission and its audience with a shocking rendition of corruption involving the selection of Jonathan Lippman to the highest judicial post of Chief Justice at New York’s Court of Appeals. He gave testimony before the 2009 Senate Judiciary Committee hearings, provided complaints before the state Judicial Conduct Commission and furnished reports in response to Preet Bharara’s request for input following the disbanding of the Moreland Commission, all of which went un-answered. What happened to these speakers and their presentations? Where are they today? More to the point, what can we, the people, do to get the answers? What can we do to obtain follow-up on all the corruption which could have been heard from all those good citizens left out in the audience or in the streets? Why is all this being swept under the carpet? If we do nothing, we guarantee more of the same or worse corruption in years to come, not a very good legacy for all the children and future generations harmed by the same corruption. It’s a trillion dollar “cottage industry” as one speaker plainly put it, and it shows no sign of correction. Consequently I am asking our followers and advocates of good government everywhere to join my petition for a People’s (Moreland) Commission on Public Corruption. Kindly spread the word, make it viral as you are so good at doing, send me your credentials, suggestions and support, and let’s give this government something it never expected. We can conduct a preliminary conference call when enough interest is offered, followed by a meeting at Pace University, State Plaza in Albany or any other location for hearings. We can apply FOIA and subpoena powers where possible, and issue our own final report for media consumption and government deliberation. And, unlike the costly Commission, we can do the necessary follow-up ourselves in public, political and electoral processes. An organized protest is long overdue on this crucial subject. I can be reached at (315) 796-4000 or leonkoziol@parentingrightsinstitute.com. You can also mail your input to my attention at P.O. Box 8302; Utica, New York 13505. Finally it must be emphasized that there are many court ordeals sampled from the general public segment of the Moreland hearings which warrant a book or documentary publication. As a publishing consultant, I can offer professional assistance to anyone interested in this powerful means of influencing justice and reform. You will find the details in my October 7, 2015 post here at Leon Koziol.com. 3) Administrative review of draconian support warrant and incarceration practices by local law enforcement to prevent escalating violence reflected by murder of Walter Scott in South Carolina. Attached you will find cover letter to U.S. Attorney Loretta Lynch and first eight pages of a 37 page report. If you would like a complete copy, contact Leon at (315) 796-4000 or leonkoziol@gmail.com. And once again we ask for your ongoing support and financial contributions to keep Leon alive and working on our behalf. On a related subject, Dr. Eric Braverman has invited Leon to speak at a rally in support of Justice in divorce court. It will occur on June 25, 2015 at the Manhattan courthouse located at 100 Centre Street, 2nd Floor. We are urging all our followers in the New York metropolitan area to join us on that day in support of Dr. Braverman. Civil Rights Advocate Leon Koziol Meets Al Sharpton at Site of Walter Scott Shooting. Administrator’s note: Leon has been in Charleston, South Carolina seeking support for family court reform in light of the police shooting of an unarmed father fleeing an arrest for a child support warrant. We’ve shown you the video taken of this father shot five times in the back with no concern for his condition afterward. Leon traces the route of the same video taker at a vigil held today at the site of Walter Scott’s murder. The North Charleston police officer is in jail on murder charges. Here is what Leon reports from the vigil site. I had an opportunity to chat with Al Sharpton today at the site of Walter Scott’s murder here in North Charleston. It was during a vigil ceremony with everything about the place coming across very surreal. I have reviewed this travesty in my mind with horror, finding it hard to grasp that it was all caused by a child support warrant. Our government is actually killing fathers now for money. Of course we know that this cop who shot Walter Scott had to be deranged, but the fact is, that’s what happened here. Without the warrant, this killing would not have occurred. I focused on the exact spot where Walter Scott fell in that video which continues to haunt me as a father myself. A collection of flowers marks the spot which might as well be sacred ground today. It should move all fathers to action. We cannot allow greed and money to be a cause for police force and debtor prisons. A planned rally on June 19th (fatherless day) at the Supreme Court should be everyone’s focus to secure respect and fair treatment in our family courts. I retraced the route of this father fleeing yet another stint in prison for being a support debtor. I struggled with the sounds of eight gun shots, five which landed in the back and one through the heart. I examined the distance between the officer and the location where the victim fell. I recalled how the cop casually walked over and hand-cuffed the debtor as he took his final breath. The family court warrant had now been executed! On the other side of a worn-out fence, I placed myself in the shoes of the video taker. I was amazed at how he had to be in the right place and the right time for justice to be served. Fortunately he had the courage and presence of mind to complete his vital mission under a profound fear of being shot himself. Gradually the crowd and camera crews dissipated. I was among the last to leave when I noted a biker gang in an adjacent lot. Out of respect for the attendees, they waited patiently and largely unnoticed until the place was empty. Then they formed a loud circular procession in order to make their own statement, concluding with a united linear back-up to the vicinity where the cop committed his crime. I felt a bit like the video taker when I captured this scene from the other side of the fence. A collection of flowers marks the spot which might as well be sacred ground. The Los Angeles Times refers to him as the popular South Carolina mayor who’s weathered the storm over the police killing of an unarmed African-American father fleeing from a child support warrant. And I had a chance to meet him personally after sharing my purpose for being in his city. His name is Keith Summey and he was accompanied by a very personable and helpful assistant who listened intently to my own ordeals as a fathers rights advocate. Later I participated in another media session outside the church in North Charleston after hearing a riveting sermon by Reverend Al Sharpton. Don’t ask how I managed to get in, but the kind ushers I’ve come to know at various events helped out. Here the people have been remarkably kind, compassionate and even cheerful. They have welcomed me with open arms during these trying times. And you have to hand it to Al Sharpton, he really knows how to get a crowd going in so many ways. From passionate sermonizing to stand-up comedy, Reverend Sharpton had everyone laughing and loving one another by the time of benediction. Outside, it was back to business as Mayor Summey gave an update short of disclosing details of ongoing investigations. A civil rights lawsuit has already been filed of the kind I routinely prosecuted back in New York. I have been invited to join a congregation which is sponsoring a candlelight vigil at the scene of the Walter Scott shooting made infamous by that shocking video seen around the world. Last night I spoke with leaders who sponsored a protest inside North Charleston City Hall. I’ve been handing out my 25-page report released last month entitled “We Are Fathers.” In it, I predicted continued violence and victimization among minority fathers due to a broad failure of our family courts and federal government to recall and reform draconian support enforcement practices. I also predicted that it would place law enforcement in harm’s way. You don’t take a child away from its parents without proper cause. Support debts are not a valid cause, and you don’t come between a father and his children without risking serious emotional reactions. I shared my report with Fox News and other media on the scene of these daily events. Excerpts of that report have been published at Leon Koziol.com in a series entitled “King’s Chronicles.” Stay tuned for more updates to include a mass protest at City Hall tomorrow which was announced only moments ago. Christopher Mathias of the Huffington Post says: One-Eighth Of South Carolina Inmates Were Jailed Over Child Support Payments. Walter Scott Was One Of Them.